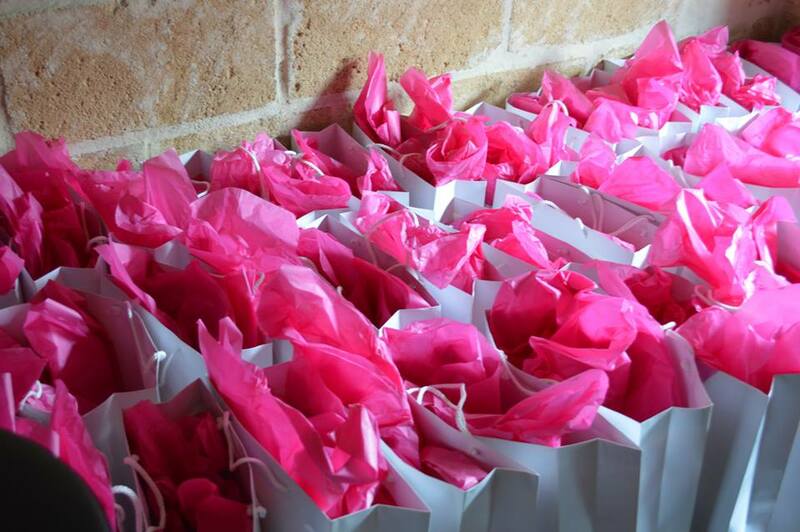 …gosh, who am I kidding – it’s ALL about the goodie bag haul!!! Right … so, I am an admin on this fancy-pancy, awesome Facebook page called Makeup Obsessives (with accompanying website here). Three or four times a year, Kirsty – the Queen of MUO – travels to different parts of the country with some of her admin team and holds a meet up where about 80 or so lucky ladies get to meet fellow Makeup Obsessives and talk about … you guessed it, makeup! Read here about my first goodie bag – I mean, my first meet up in Hamilton! ♥ Elvive Total Repair shampoo and conditioner – full-sized products – these are awesome products – I got one in my Hamilton goodie bag and they make my hair feel really silky. ♥ L’Oreal Revitalift Magic Blur skin smoother/finishing cream – 30ml. I think this is full-size; if not, it’s a VERY generous sample. Anyway, this is supposed to magically blur my fine lines and wrinkles, so I have high hopes for it! ♥ A contouring makeup brush from Makeup.co.nz UPDATE: this is great – I’ve been using it a lot. ♥ Garnier BB cream in light – this is lovely, and sadly – even though it’s the middle of summer – it’s not too light for me! I’ve tried it already and its a lovely light product to wear when you kinda don’t want to be wearing makeup! It gets the tick. UPDATE: this is currently my every-day foundation! ♥ Trilogy Very Gentle Cleansing Cream sample – love Trilogy products so am looking forward to trying this one. ♥ Schwarzkopf Omega Repair Shampoo and Omega Repair BB Beauty Balm samples. These are both for damaged hair, so unfortunately they are perfect for me! ♥ Schwarzkopf Omega Repair Shampoo & Conditioner samples – see above. And right here in the middle of all the gorgeous goodie bag items is a picture of fellow MUO admin, Kezia, because her makeup was SO gorgeous on the day and I never got around to telling her that. ♥ Bioré Deep Pore Charcoal Cleanser sample. I’m thinking this could be a “mud-type” product – will let you know. UPDATE: it’s not a “mud-type” product – it’s like a charcoal-coloured gel. I thought it was a mask for some reason but it’s not – it’s a cleanser. You know when you have one of those REALLY strong little mints and it makes your mouth all tingly? Well this stuff is like that – but for your face. So far, so good – my face feels amazingly clean. ♥ Schwarzkopf BB 11-in-1 Hair Beautifier – 100ml. This stuff is fab and is really great for imparting a bit of shine and smoothing down those pesky little flyaways. ♥ Schwarzkopf 6 Miracles Oil Essence sample – one miracle is probably enough for my hair, but I’m more than happy to take six! This is a leave-in so I will give this a go over the next little while and report back. ♥ Tan Wash Off Bronze – instant tan 40g. I think they call this a deluxe sample? Anyway – it’s great and I am looking forward to trying it very soon – as you can gather from the name, it’s an instant, wash-off tan. ♥ Le Tan Flash Tan 45g – tan in a can Sounds like Doctor Seuss! Anyway, fake is the only type of tan I sport these days – it says it’s streak-free and natural looking. I will be the judge of that! ♥ Schwarzkopf Instant Volume Powder – I must admit, I already have this in my little “hair arsenal” and love it, so I was very pleased to get another. Full-sized product. ♥ L’Oreal Professional Infinium hairspray 75ml. Perfect for the handbag and seems to hold pretty well so far. I must admit to having two of these – there was ahem, a bit of a scrabble when Kirsty emptied a “left-over goodie bag” on the table and in the melee I managed to pick up, in a very dignified manner of course, another one of these! OK – at this halfway juncture, I thought I’d include this fabulous group shot of all the attendees. Awesome huh! ♥ Lush soap – which smells delicious and strawberry-y. ♥ Innoxa Pure Silk skin primer – am looking forward to trying this – I love Innoxa stuff – it reminds me of when I was young! ♥ Perfect Platinum – shampoo and conditioner samples – 50ml. Miraculously these have appeared in my daughter’s shower, so I guess I won’t be reviewing them any time soon! ♥ Designer Brands – Hi-Lights Illuminator – shhhhh, I’ve never used an illuminator before! And my goodness, I am LOVING this one. Soooo pretty. UPDATE: I’ve been using this every day and I love it! ♥ Elizabeth Arden Precision Glide eyeliner pencil in Black Velvet – this is lovely and has a really nifty little thing at the end that is a) a smudger and then b) that bit pulls apart to reveal a sharpener. Well played Elizabeth Arden! ♥ Designer Brands – Natural Ground Minerals Bronzer 316 – full size. This is really nice and I’ve been using it in my contouring attempts – so far, so good. ♥ Maybelline Colour Whisper lipstick – in Orange Attitude. This is a lovely summer colour, and as the name suggests, is a “whisper” of colour – kind of like an intense gloss I guess you’d call it. Am.liking. ♥ Sebamed Clear Face Care Gel – claimed by my daughter, moisturing gel to combat pimples, blackheads and the like – not that she needs it, but I’m happy for her to have it. I looked on the internet and it gets pretty good reviews. ♥ Schwarzkopf Live Colour Ultra Bright – bright pink hair dye! Certainly not for the faint-hearted that one, and in fairness, probably won’t get used at our house! UPDATE: still in my drawer! ♥ Living Nature mineral eyeshadow – in slate. This is lovely stuff, and when I get around to a smoky eye again, this will be perfect. Also … there were giveaways!!! For everyone!!! 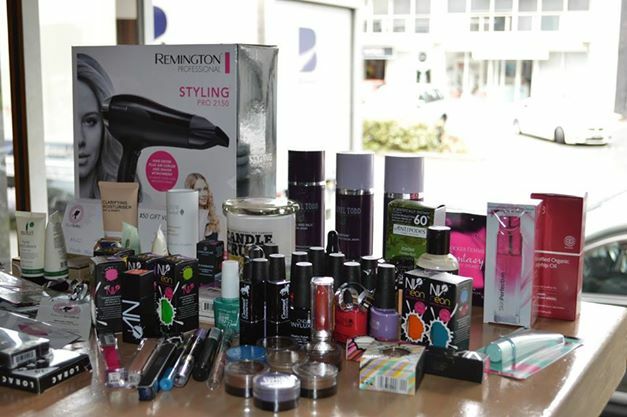 (Including Micro Mini Beauty Blenders, LORAC palettes, perfume, nail polishes, eyeshadows, a hairdryer, a candle … ALL SORTS!) I got a gorgeous neon orange nail polish (you can see it there in the box – next to the blue one) – and yep, you guessed it – my daughter’s got it! 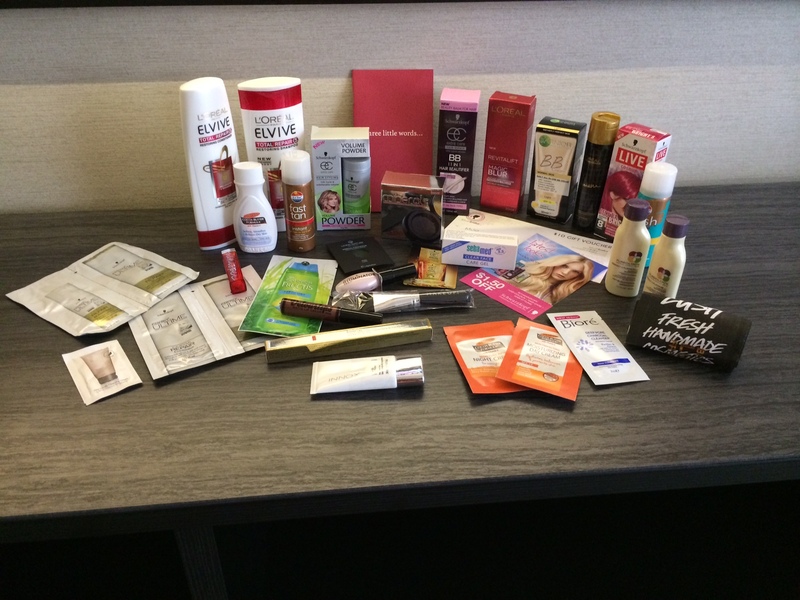 So … that was my goodie bag … in a blog post! Goodie bags are an awesome opportunity to try new products without the financial commitment of purchasing the full-sized version – let’s face it, you don’t always like or suit everything you try! I’d like to give all the sponsors of the goodie bag items a great.big.thanks for supporting Makeup Obsessives – as an MUO, and as an admin, I can say it’s most appreciated! And thank you too to Kirsty and Nicola for all your effort in making the MUO meet ups such awesome events – I know they put their heart and soul and a great deal of their time into these meet ups to make them the fabulous events they are. It’s not often enough that you get the opportunity to meet your “like-minded, social media friends” in real life! 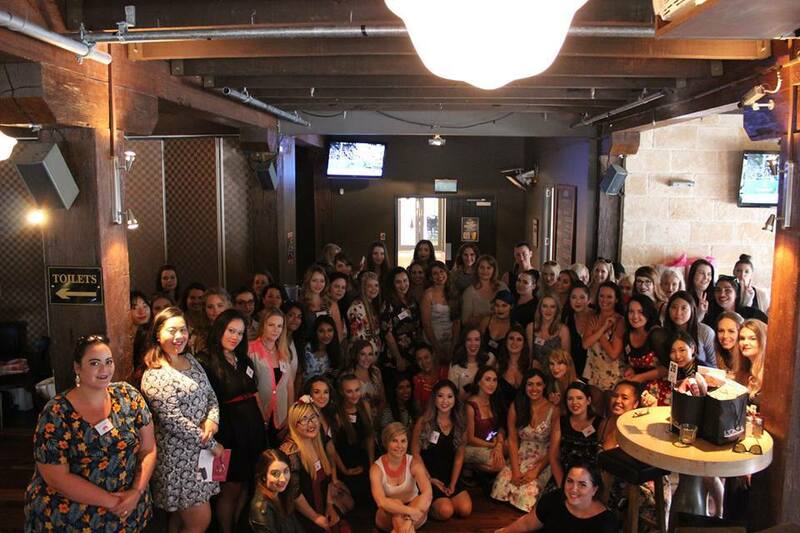 And to round this post off, here is a picture of the fearless Makeup Obsessives admin team – some of them anyway – they are scattered all over the country (and one in Australia **waves frantically at Arna! **) so can’t always make it to the meetups. It seems that it may be near impossible to get a serious pic of this team! I hope you enjoyed this second sneaky peek into my goodie bag … please share the love and support these fabulous brands if you can – you won’t regret it, I promise! 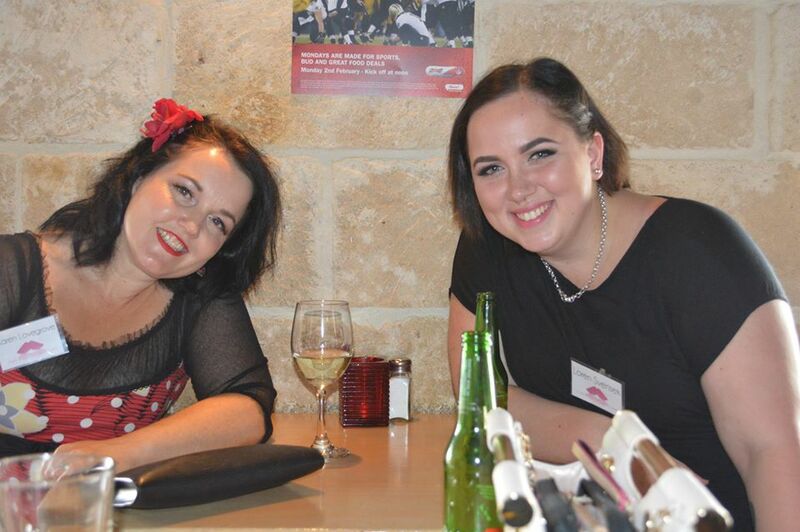 Here’s me with my gorgeous fellow admin friend, Loren – who has Elizabeth Taylor eyes. And lastly, for the meetup from another blogger’s perspective, click here for Lena Talks Beauty’s blog post about it. 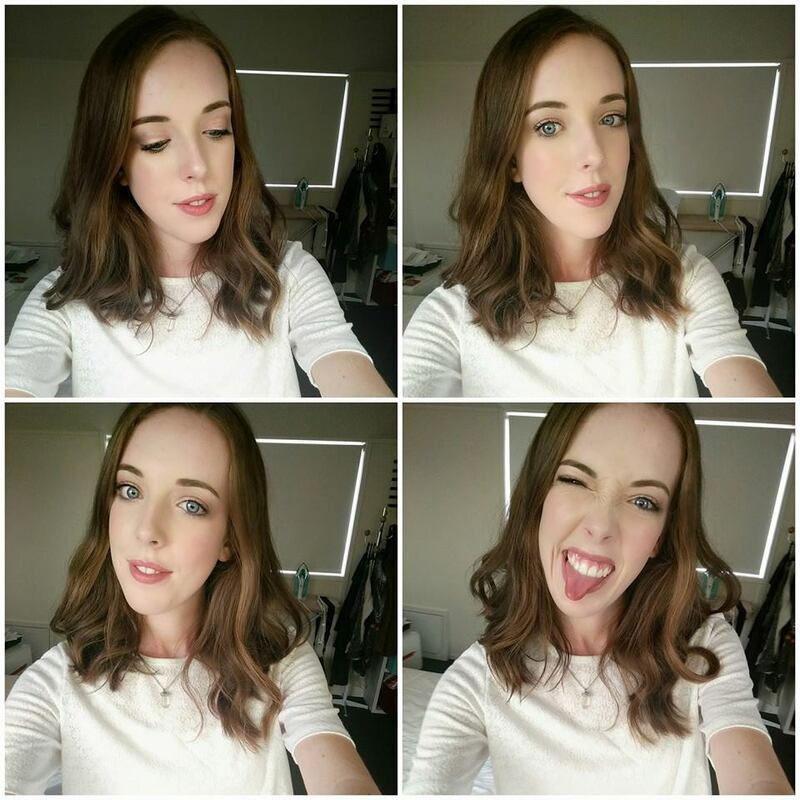 Posted on February 10, 2015 September 30, 2018 by MumptyStylePosted in Makeup/Skincare, Mumpty ReviewsTagged Blush Baby, Makeup Obsessives, Makeup Obsessives Meetup, The Paddington. It was a great event! I’ve found some of my favourite products through samples in MUO meet up bags, and I’ve made a point of telling the brands that, like when I ordered a full size Oasis Beauty Rhino Repair!